Bupa today published a report on Hong Kong's private healthcare market that highlights the key role of data transparency in improving consumers' healthcare experience and the sustainability of the healthcare system. The research conducted by Asia Care Group on behalf of Bupa examines transparency across the areas of finance, quality, and patient experience. Analysing local market data sources and statistics from the Food and Health Bureau, the Hong Kong Federation of Insurers and Hospital Authority, along with international best practices that have been successfully adopted in other markets such as US, UK, Australia and Singapore. The research finds that Hong Kong people's actual out-of-pocket (OOP) expenditure on health more than quadrupled to over HKD 43 billion between 1989/90 and 2013/14. Prices of the same procedures delivered for different "room class" vary a lot and there is no published quality data to support such variation. For instance, cataract removal can cost private-room patients over 40% more than semi-private room patients, largely driven by higher surgical and doctor fees. Hong Kong does not have a system-wide approach to monitoring the quality and performance of private healthcare providers that is consistent with international norms and best practice. As a result, it is difficult for patients to assess the quality of prospective providers on key indicators such as mortality rates, readmission rates, infection rates or surgical revision rates. Consumers are prevented from making more informed decisions due to inconsistent information such as unclear price breakdowns and incomplete procedure lists. As found by the Food and Health Bureau*, provider pricing data in its current form is not sufficiently informative for those seeking to make like for like comparisons between providers. The report highlights the important role of data in increasing transparency, reducing costs and increasing quality as demonstrated by best practices from the UK, Australia, Singapore and the U.S. that can be readily adapted to Hong Kong. Amongst a number of calls to action for the benefit of consumers, the report calls on the Government to create frameworks and standards for healthcare data that the private sector can adopt and implement consistently. It recommends private providers invest more in electronic data systems and electronic health records, and insurers drive change in the market through the contracts they negotiate with providers. 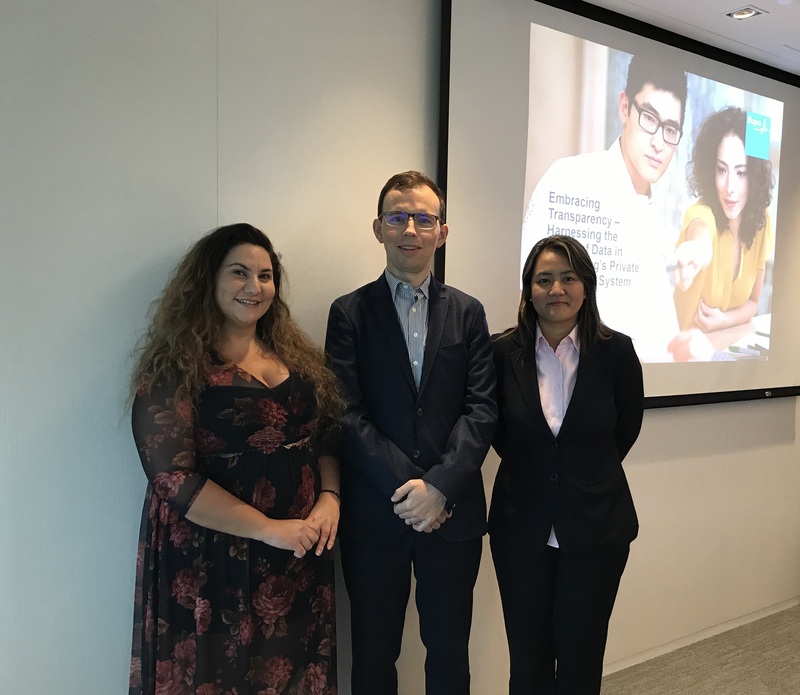 Mr. William Brocklehurst, Director of Corporate Affairs, Bupa Hong Kong (Middle) introduced the report today, along with the detailed presentation by Dr. Sarah Salvilla, Medical and Health Risk Management Director – International Markets, Bupa (Right) and Ms Thalia Georgiou, Founder of Asia Care Group (Left). They have also given recommendation on behalf of Bupa. Bupa is UK's largest health insurer. * In Hong Kong, we are known as the health insurance specialist. We have gained the trust of more than 400,000 individuals, and 3,200 companies including major corporations in public utility and telecom industries. We have been providing quality health insurance for Hong Kong's civil servants for more than 20 years. Bupa also provides primary care services through Quality HealthCare Medical Services (QHMS), one of Hong Kong's largest private clinic networks.